will be held or if it is canceled. The calendar link also includes the meeting agenda. are held on the second Wednesday of each month from 4:00 to 6:00 p.m.
are held on the fourth Thursday of each month from 3:30 to 5:30 p.m.
are held on the first Wednesday of each month from 3:30 to 5:00 p.m.
> Click here for Meeting Calendar. Special Meetings and the annual ARTSFUND Grant Panel Review Meeting can also be found on the Meeting Calendar. 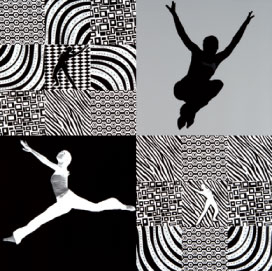 Umi Vaughan, Dance!, 2006, photo quilt on canvas, 32 x 32 inches. Artwork is part of the Alameda County Art Collection: Artwork Created by Alameda County Artists. Photo: Sibila Savage.